Following its successful Extended Test and Evaluation Program on-board a US Navy ship earlier this year, TELEGRID continued focusing on utilizing wireless mesh network technology on military and commercial sea-going vessels in order to reduce cost while improving operations. 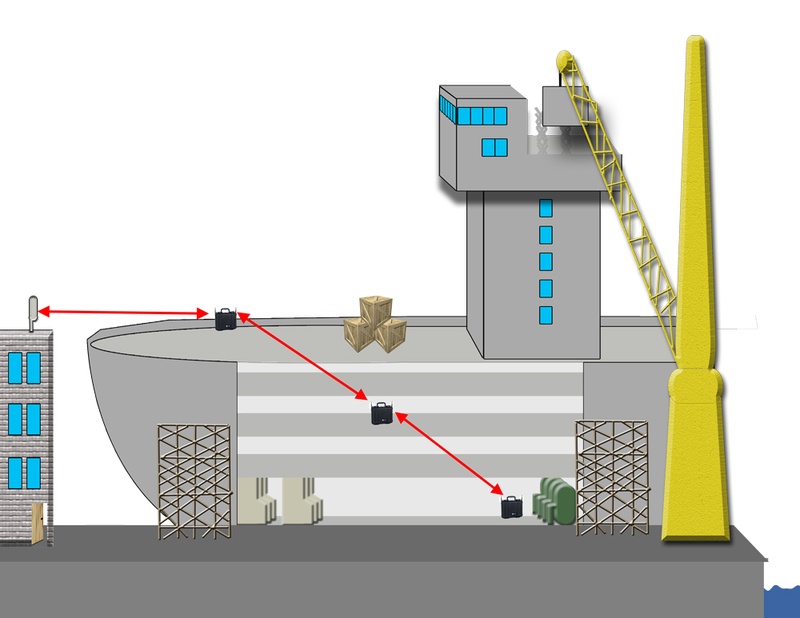 As described in the White Paper provided below, wireless mesh networks can be an important tool during ship construction as well as during normal ship operations and maintenance. Portable mesh repeaters now being produced by TELEGRID can provide ship builders and operators with increased flexibility and reduced costs during various phases of a ship’s life-cycle. Affordability in ship construction continues to be a primary concern. PEO Ships and NAVSEA Program Managers have challenged industry to provide innovative solutions to the rising costs of ship construction. This white paper describes the benefits of deploying a temporary wireless mesh network during the construction phase of a ship to reduce the risk and associated costs of finding problems in mission critical electronics systems later in the ship construction process. the ship builder with the opportunity to save money. Reworking any system becomes significantly more expensive the later in ship construction problems are discovered. Additionally, a problem discovered during builder’s trials could result in delaying at sea trials or even ship delivery. Besides providing extremely “bad press”, delays in ship delivery have been estimated to cost shipbuilders … click here to read the rest of the White Paper. In the last quarter TELEGRID was awarded multiple contracts in two of its major business areas: wireless mesh networks and network operations (NetOps) tools. In the wireless mesh domain, TELEGRID’s WZRDnet network was selected by a European water utility company to provide communications during installation and maintenance of water tunnels and facilities. The WZRDnet mesh network’s ability to hop around corners makes it an ideal solution for mines, tunnels and ships. WZRDnet handsets were also selected by the US Government in order to test their use as a transport mechanism connecting off-the-shelf Android smartphones. These smartphones have had their cellular and Wi-Fi functions disabled and are used mainly to provide mission-specific apps to the warfighter. The WZRDnet will allow transmission of GPS and sensor data between these smartphones. In the NetOps tools domain, TELEGRID’s Secure Multi-Web Remoting Tool (SMRT) was again selected by the Defense Information Systems Agency (DISA) for the management of banks of communications encryptors commonly used by the US Military. The SMRT display provides at-a-glance status indication of each individual device and allows operators to “drill down” to the web configuration tool of each device. Its simplicity and flexibility allows reduced man-power needs in installations. DISA has also purchased TELEGRID’s Secure Management Agent (SMA), a device which incorporates non-secure management tools into secure networks. TELEGRID is continuing its efforts to identify and hire top-level engineering and software developer talent for our facility in Livingston New Jersey. We recently welcomed to the TELEGRID family a new Senior Engineer with extensive radio experience including time spent at the S&TCD directorate’s SRW-RIL (Radio Implementation Lab) in Aberdeen Proving Ground (APG). There he was responsible for software integration, radio performance and certification. If you are a top-level engineer or software developer who feels that you could enhance our team’s capabilities, please send your resume to hr@telegrid.com.